Building a wall is something that many people think is a preserve of professionals who have skills in building and construction. However, with the right knowledge, it is possible for someone who does not have prior experience to build a wall. Below is a detailed process that will allow you to build a strong and durable wall regardless of your experience in building and construction. Before going into detail, it is vital to understand the different types of walls one can build. Depending on material used, there are brick walls and frame walls. Walls can also be built for different purposes like holding soil to reduce erosion, in which case one will be building a retaining wall. In other cases one may build a wall to partition the house. Whether the purpose of the wall is to decorate the garden or to put something elaborate, you will not need to stress a lot while building a brick wall. The only thing one is required to maintain is attention to detail so as to achieve the required quality. Below are simple instructions for easy construction of a brick wall. Before the work begins, ensure all needed materials are bought in time. Purchase enough bricks and make sure to choose a size that will not be difficult to handle. Also pay attention to the shape of the brick because this also determines the final look of the wall. Walls usually use ½-inch mortar and most bricks measure 3-5/8 inches wide and 2-1/4 tall and a length of 7-5/8 inches. Therefore, afters applying mortar, the actual size will increase. Make sure to add mortar measurements while planning the wall. This involves digging out a trench that will seat the wall. The trench should be rectangular in shape, roughly 1 foot deep if the wall is estimated to measure three feet. Once the trench is ready, make a solid layer of concrete. Buy Portland type I cement and concrete that is sufficient for the project. Also make sure to have the mixing container on site to make work easier. There are two options for ratios that should be observed in the whole process. 1:2:3 ratio containing water, cement and sand respectively is perfect, not forgetting cement to sand to gravel should be mixed in a 1:2:3 ratio. Mix the dry parts of gravel, cement and sand before adding water to form concrete. Drive several wooden sticks into the soil and ensure all their tops are lying on the same level. With this, it will be easy to measure the nominal height of the bricks (allowance for mortar included). Drive the sticks further until they attain the nominal height of the bricks, still ensuring they are all level. The posts should be 2-4 feet apart. Take three parts of sand to one part of cement. Mix the two until they blend well then form the shape of a mountain from the mixture. Make a hole at the centre of the small mountain you have formed to pave way for water. For a bag of mortar, it is advisable to use three gallons of water for perfect consistency. Consider ambient conditions like temperature as they may also affect the amount of water used. If the wall will be exposed to strong winds and elements, adding lime will help increase bonding. Several items are needed for the construction. Some of the essentials that will help to make the work perfect include a string and nails, level, club hammer, tape measure and brick jointer. The first row of bricks is laid on the foundation and left to dry. Make sure to leave sufficient space to account for the mortar. Use the tape measure to measure the correct distance between each brick. On the first guideline, clamp a string for the second layer. The string should run from one gauging rod to another for a straight level line. Also check to ensure the line does not sag to avoid structural issues once the wall is complete. 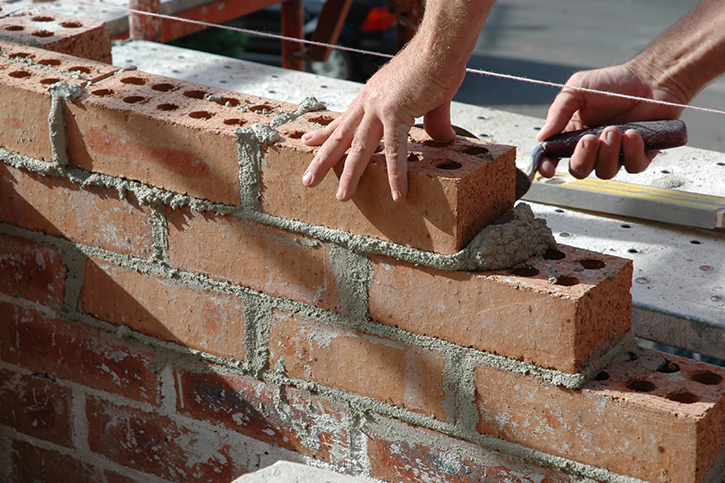 Cover the first layer of bricks with mortar, ensuring all gaps between bricks are filled. Use the trowel to lightly press mortar between bricks. The brick should also be pressed into the mortar for reinforcement. Check using the level to ensure the bricks are flush to the ground and placed in a straight line. All excess mortar should be scrapped and returned to the bucket. Repeat the above procedure for all other rows, giving time to dry and watering after every four rows. Water the structure every morning and evening and leave at least two days to dry before starting the next row. Use a brick jointer to decorate the wall with perfect curves between joints. When cutting bricks and preparing mortar, put on safety goggles and gloves. Also put on hats in case something falls from above while working. To reduce erosion, one can build a retaining wall. It also improves water drainage and makes usable garden space. This is a simple home improvement project that can be finished in one weekend. The first step before work begins is to contact local utilities officers to know whether there are pipes or cables where the wall is supposed to stand. The layout could be simple and made using a garden hose, which helps to mark the ground for digging. Use a shovel to dig a trench following the line laid out. The trench should best bigger than the blocks to offer better space for placement of mortar. Using a soil tamper, pack down the base of the trench. Add patio paver 4-6 inches and compact further for stability. The paver should be raked until uniformity is achieved. The foundation forms the most critical part of the wall and gives the rest of the wall direction and flow. Foundation blocks should be levelled off and packed well together. Use corner stones and a string to draw a line for subsequent blocks and to ensure the blocks are placed on a straight line. If the blocks have top tongues, use a chisel to cut it into the right shape. Tongues may prevent interlocking and make it difficult to achieve a perfect finish. Complete the first layer by applying course sand and levelling it off with a rubber mallet. The finish must be level so as to make it easier to lay the second row. Depending on the size of the wall draping the filler keeps the soil from contaminating the backfill. Start the second layer ensuring the top layer seams are placed offset to the ones below. Before applying the adhesive, confirm whether the placement of the blocks on the foundation is perfect enough. If necessary, some parts should be trimmed to fit well on the row and to match with the rows below. Use the procedure until the wall is complete.